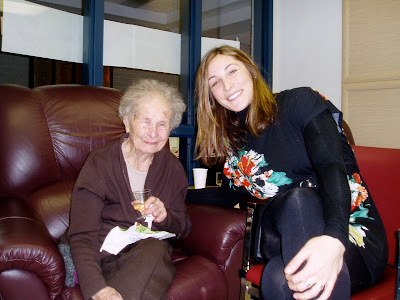 February 24th marked my grandma's 100th birthday. And, evidently, the saying is often true that men marry their mothers... my mom's birthday is on February 24th as well. In celebration, my family met up in Winnipeg, Manitoba for a weekend of champagne, cake and cards. We have a fairly small family so when we round up 14 people for a birthday, we've done pretty well. Mary was thankful but has always felt uncomfortable when there's any fuss over her. My brother's and I assured her that we were only there for the cake and perogies. And perogies we had. When we were younger, we would get Baba to make perogies during our visit and then fly home with them in our carry-on. The first day, we picked up 4 dozen perogies from the local church luncheon and I've never tasted anything so fluffy. Mmmm. Baba's not able to make perogies anymore but her sister probably could. That's Auntie Nellie and I at the party. She's only 97. Ha. And this is Baba reading her card from the Queen. 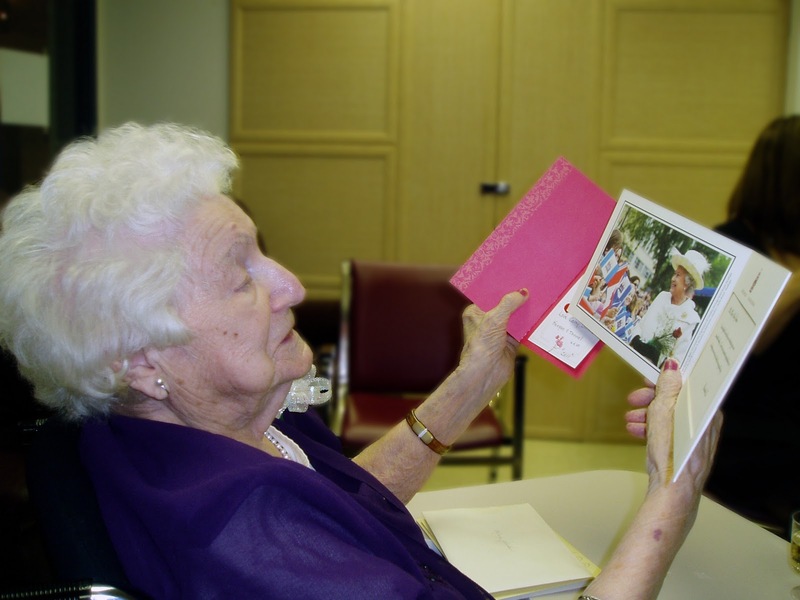 She also received a card from Stephen Harper. It's nice that they recognize centurions. Born in 1911, Baba lived through an incredible 100 years. She has memories of both World Wars. The three days in Winnipeg were extremely cold but so warm on the heart. I always love to have my family under the same roof. No, not always. At 3am when I'm trying to sleep and my brother's are snoring in sync, I don't love it. And when I eat a soggy pretzel from the bowl because my little cousin has sucked the salt off, I don't love it. But family cannot be defined by snoring and soggy pretzels. I love them with my whole heart and I hope we all have a 100 years of life in us. Cheers.